The Coats for Kids annual collection drive is underway at Crocker Park and Eton Chagrin Blvd. Collection bins have been placed inside the parking garages at both locations, and will be in place through early January. So please consider donating a new, or like-new coat in all sizes – infant to adult – this holiday season to help a child in need. You can also support the drive by donating money to the cause. “The need to keep area children warm … is still great. 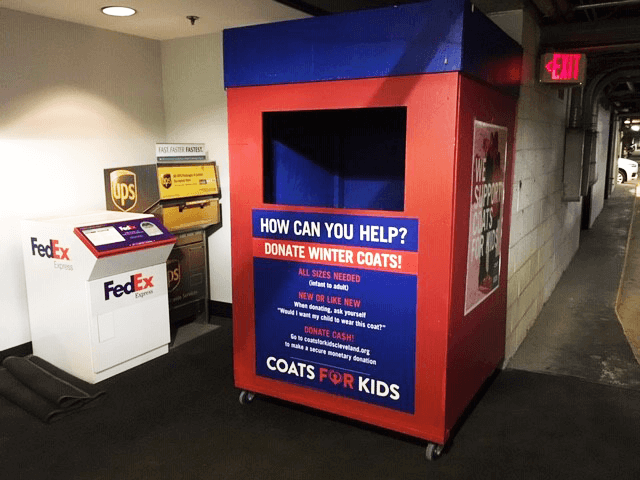 Coat and monetary donations are always needed, and without your ongoing support, Coats for Kids would not exist.” Learn more at the Coats for Kids website, coatsforkidscleveland.org. The charity drive was also recently featured on wkyc.com highlighting all of the various locations of the collection bins. Read more and view collection bin locations at wkyc.com. Eton Chagrin Boulevard is Cleveland’s luxury fashion district – the place where authentic, one-of-a-kind boutiques and fine dining blend with the hippest national brands, including Tiffany & Co., The Apple Store, and lululemon. This mixed-use property consists of 330,000 square feet of upscale retailers, specialty shops and exclusive dining, many of which are the only locations in the region. Special events, outdoor chessboards and an award-winning garden further add to the center’s unrivaled ambiance. Located just east of the I-271/Chagrin Boulevard interchange, Eton Chagrin Boulevard is situated amongst the area’s highest income neighborhoods. For more information visit etonchagrinblvd.com.